The UAD Neve EQs were used all over the place. The 88RS was my default, go to, “normal” EQ. When I had a special track that needed something extra, I went with the 1073. I have no idea how these plugins work their magic, but when you use them as you normally would use an EQ on all the tracks in a mix it ends up sounding better. I used the shelving filters on the 88RS a lot to clear up some sonic space, which was needed with a bunch of tracks drenched in effects. And the 1073 is great to make a track that’s missing something sound “right”. All the UAD EQs are great, but these two were my favorites. The UAD Dimension D is a special chorus that sounds great on synths and just makes a given part sound a little more special. I associate it with a Cocteau Twins type sound, very dreamy and swirly and spacey. Biggest problem I had with this plugin was trying not to overuse it, and I probably failed at that. Something sounds a little boring? Try strapping a Dimension D on it! I also used the UAD Roland CE-1 chorus plugin a fair amount, for both chorus and vibrato. The UAD Plate 140 is a great sounding plate reverb modelled after the classic EMT plates. It just sounds good, really good, and is very easy to tweak. I used this all over the place. 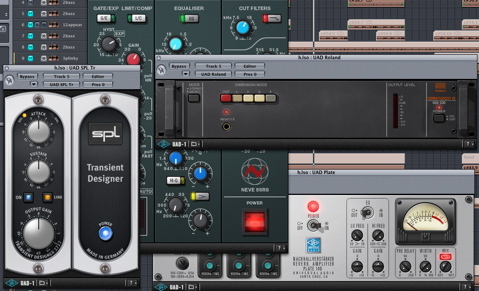 The UAD SPL Transient Designer was a late addition, but very useful when doing the mixes. This one lets you increase or decrease the attack of a sound, basically like re-doing the amp envelope of a sound after its been recorded. On drums the plugin is great, it allows you to add or remove some punch on individual drum parts to get the overall drum bus feeling right, and I ended up using it on at least a couple drum sounds on each song. On synth tracks it was useful for bringing forward prominent tracks by adding some attack or pushing them back by decreasing attack. Of course you could re-record the tracks and tweak the patches, but this allows you to make little adjustments at mix time with a single plugin and not get thrown off track. I also found it useful for pushing certain effects such as delays back in the mix, which allowed me to bring up their volume more so they could be heard, while not cluttering up the mix as much. Very easy plugin to use, too, just a couple knobs that do what you want them to do. Echoboy became my delay plugin of choice. Since I use a lot (too much?) delay, I probably used this plugin more than any other one. The native AU version was released while I was working on slowburn, and it answered all my prayers for a great sounding, flexible, vintage hardware inspired delay plugin. It covers a variety of different hardware delay styles: BBD analog, Space Echo tapes, digital, and it can even do chorus and other delay based modulation effects. Love it, love it, love it. In their effects pack, they also have a phaser plugin that sounds excellent. Audio Damage released three vintage-inspired plugins while I was working on slowburn. The chorus, Fluid, sounds like a guitar chorus effects pedal, very lush and lovely. 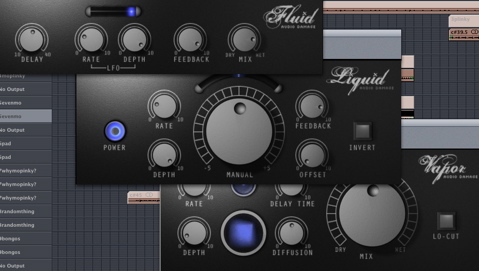 The flanger, Liquid, again sounds like a hardware effect and has a particularly nice option to spread the stereo field. The final effect was Vapor, which is a sort of reverb-chorus that doesn’t have a direct effects pedal analog, but adds a nice extra something to the space around a sound. All three are great, cheap, not too complicated, and if they’d been released before I started the album I probably wouldn’t have bothered with buying any hardware modulation effects at all. Their Dubstation analog-style delay plugin is also great. Logic’s Direction Mixer was something I hadn’t used much before, but I used it extensively in this project. Basically it lets you spread or constrain the dimension of the stereo field for a given track. This lets you position a track very precisely in the stereo field, not only pan position but how wide it spreads at that position. The allowed me to use a lot of chorus and other modulation effects without things getting too muddied up, by placing sounds in specific places the mixes and sounds would really gel together much easier instead of just stomping on each other. It also let me do neat tricks like make the delays or reverbs have a different width than the original track, which again helped clear up the mixes. Now I use this plugin on pretty much every track. Sonalksis SV-719 Gate and SV-315 Compressor: The gate was used to remove noise from tracks that were suffering from hiss (usually as a result of being sent through the excellent Culture Vulture to be warmed up), easy to use, flexible, just works. The Compressor was used for sidechain compression, so that for instance when the kick drum hit, the bassline would be compressed to make some sonic room for it. Another place I used it was on the delays, so that whenever the original track was playing its delay effects were compressed and made a bit quieter. This is an effect called a ducking delay, but Echoboy doesn’t do ducking delays, so I achieved the same effect by putting the delay on a separate track and using sidechain compression with the Sonalksis compressor. Sonalksis also has some nice, intentionally simple plugins in their TBK line that do filtering, distortion, and compression with one big knob to control them. IK Multimedia CSR Reverb: Very nice sounding native reverb, lush and Lexicon-y. I used this a lot on pads. I like the UAD Plate 140 better for plate reverb, but the hall reverbs in particular were great here and it’s very easy to use. Posted by art on Sunday, April 12th, 2009, at 6:34 am, and filed under Recap.